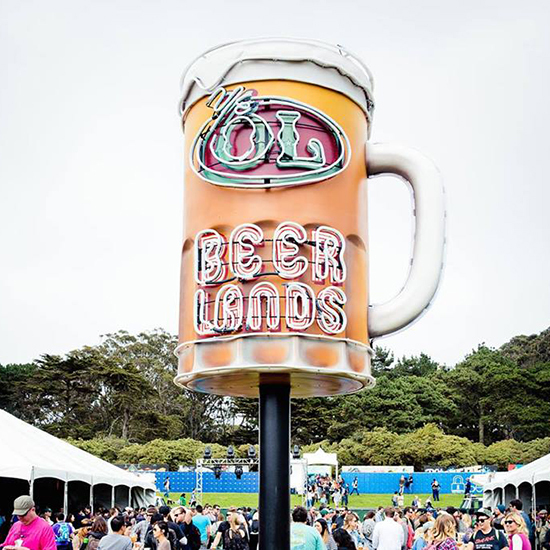 Next weekend, Outside Lands will take over San Francisco’s Golden Gate Park for the seventh year in a row. There will be incredible musical acts like Kanye West and the Flaming Lips. There will be awesome comedy from people like Chris Gethard and Aisha Tyler. There will be amazing drinks and food—including an entire section of the festival dedicated to chocolate, and another for beer (see Beer Lands, above). And for the first time, the organizers will introduce GastroMagic. That’s not a new drug that we really want to try, or a culinary magic show, which some innovator needs to Kickstart, but a new stage. There, gastro-centric acts will feature comedian Lewis Black chatting with wine expert Paul Grieco about what to drink with barbecue, butchers competing to break down pigs while dancers perform on stage, and Queen of Bounce Big Freedia making audience members twerk for beignets. As for sustenance, the new area will house Bacon Land, serving a menu that includes bacon flights and bacon grilled cheeses. Cocktails curated by bartenders from top San Francisco bars like 15 Romolo, Alembic and Local Edition will also be available, which is good, because you’ll need a few drinks to loosen up before participating in the weekend-ending mezcal discussion/limbo contest. Visit SFOutsidelands.com for the complete GastroMagic lineup.